CTF Time Return reset time increasing from 12 seconds to 15 seconds. With the prior settings, we were seeing games taking far too long to complete and a large percentage ending based on time rather than score. The changes listed above were made in an effort to address these two topics. 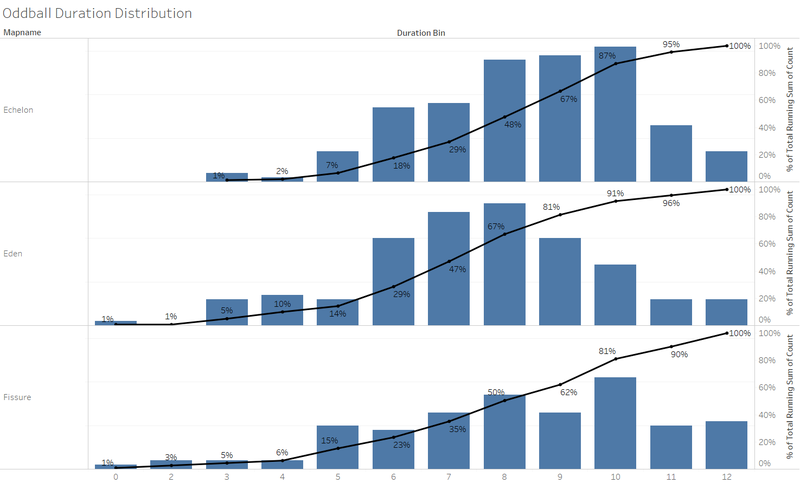 We also released some data (charts and graphs, woohoo!) in the article and you can read the entire piece here. We knew the change from 12 to 15 seconds was a subtler change, and thus far we’ve seen that the average game length has gone down by 1 minute (charts below). We feel confident that this is a change in the right direction, and we’ll be keeping a close eye on this one over the course of the season and we’ll look at more tweaks in the future if necessary. Official update: CTF Time Return reset time will now be 15 seconds. 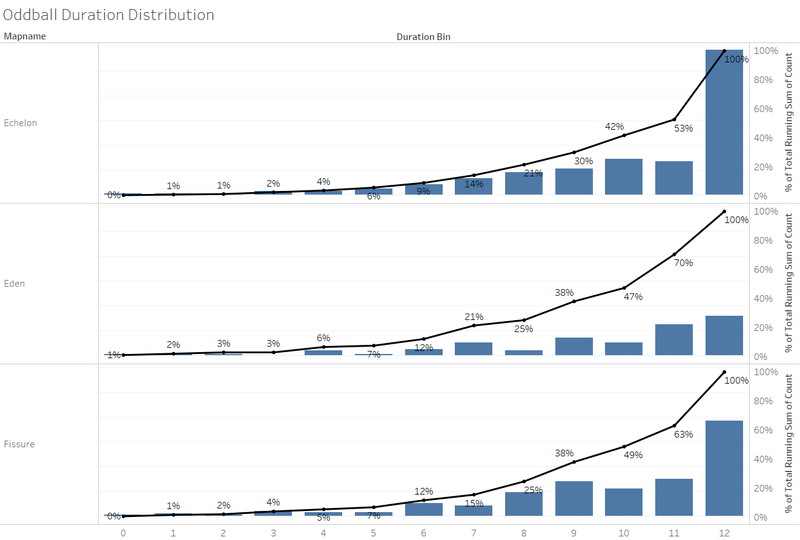 As you can see – there’s been dramatic improvement across the board with a 26% improvement to Fissure, a 31% improvement to Eden, and a 30% improvement to Echelon. This means that games are not dragging on nearly as much, and there are far fewer “dead man walking” scenarios where the losing team doesn’t have enough time to make a comeback. You’ll notice that Oddball game length has been reduced substantially, but it’s still a little bit longer than all other modes (aside from CTF on Refuge, of course). The average game length is now between 8 and 9 minutes long. We’ll continue to monitor this over time to see if it trends in any direction. As expected, the majority of matches are now ending a few minutes sooner with a great deal fewer ending at the 12-minute mark. 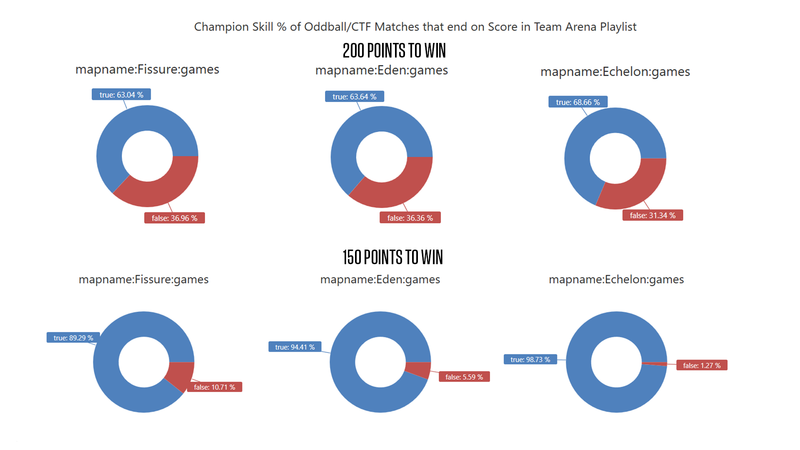 You might notice on both charts that Eden’s distribution looks a bit different than Fissure and Echelon, with a greater number of matches ending 5 minutes and sooner. This is similar to what we see in the 200 Score to Win chart, except pushed out a bit more. This is something we’ll be keeping an eye on over time and at New Orleans. Official update: Oddball will remain at 150 Score to Win. I have definitely received feedback this week that some players would prefer the Score to Win to return back to 200. Just based on the data we’ve seen with 200 points to win, we feel strongly that the match length and number of games ending based on time (vs score) was far too high, which we believe will harm tournament and viewing experiences. However, it’s something that we’ll continue to monitor and keep an eye on, as the mid-season break in August might be another time where we could revisit some items and potentially make some more tweaks. As always, feel free to hit me up on Twitter if you’ve got any questions.